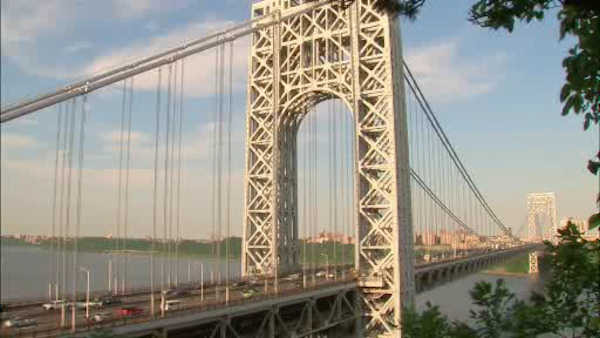 NEW YORK (WABC) -- An alert for commuters: there will be overnight lane closures this week on the George Washington Bridge. The Port Authority says that the bridge's lower level westbound lanes to New Jersey will be closed during nighttime hours, from Monday night through Thursday night, August 13, from 9 p.m. each night to 5 a.m. the following morning, and from 10 p.m. Friday, August 14, through 10 a.m. Saturday, August 15. Next week, beginning Monday, August 17, the bridge's lower level eastbound lanes are expected to close each weeknight during the same hours. Similar weeknight closures, alternating between the lower level eastbound and westbound lanes, are expected to continue through mid-October. The closures will allow for the removal of temporary construction platforms used for the upper level deck installation, the Port Authority says.